Lock in a great price for Stay Inn Hostel – rated 9.2 by recent guests! The registration process was so easy and accurate. The rooms were comfortable offering good personal privacy curtains within the room. The beds are very comfortable and the establishment is very safe and friendly. A very good place to meet other travelers in a fabulous location to all stores and transportation. I would definitely come here again and recommend it for all age of travelers. Location was great. The design and overall look of the hostel was great, very well though-out details. Lots of seating in the common area, a great patio. The bunk beds in the dorms also had curtains which is a really great addition for more privacy. Close to the DMK airport, about 10-15min walk. The beds with curtains, clean, has an AC in the room. Clean and modern. Thoughtful staff. Offering water and an energy bar to the marathon participants at checkout was a nice touch, it was appreciated. Everything was perfect, I only stayed for one night but it was really good. Karaoke night was funny and the staff are really helpful and really cool! Really cool atmosphere! Rooms are pretty good and clean bathroom. If I go back to Jerusalem I would definitely go back to this hostel. Location was perfect. Game night organized by the hostel was nice. Common area is perfect for socializing and meeting new people. I really like easy going staff and cosiness of the place together with just open minded aura of all the people I was lucky to chat. You get so much for your money, for $10 extra you can get unlimited coffee, you can wash your laundry, do a city your and get breakfast. The staff is super friendly, too! 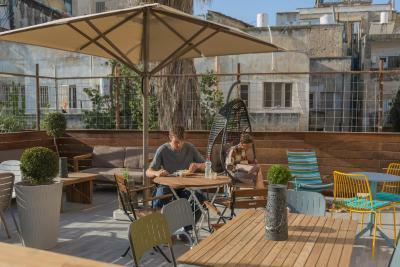 Conveniently located in Jerusalem, Stay Inn Hostel provides a buffet breakfast and free WiFi. 2.3 miles from Church of All Nations, the hostel has a terrace and a shared lounge. Attractions in the area include Garden of Gethsemane, 2.4 miles away, or Dome of the Rock, located 2.4 miles from the property. Languages spoken at the reception include English, French and Hebrew, and guests are invited to request advice on the area when needed. Western Wall is 2.4 miles from the hostel, while Holyland Model of Jerusalem is 4 miles away. 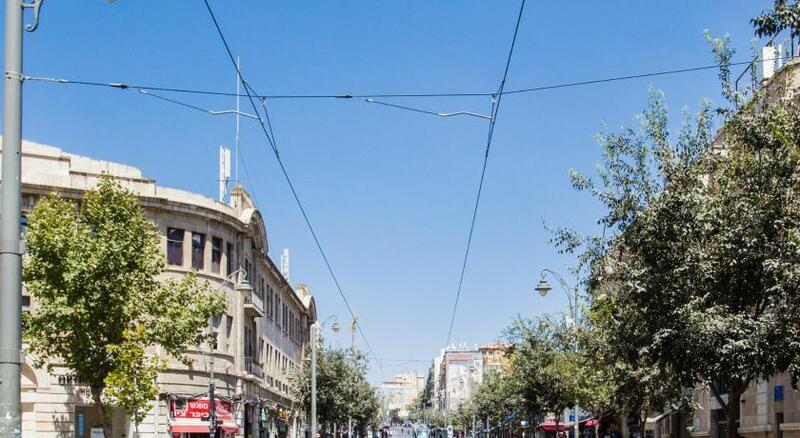 The nearest airport is Ben Gurion Airport, 32 miles from Stay Inn Hostel. 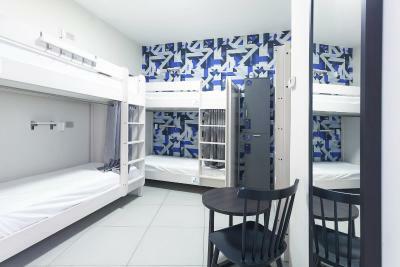 When would you like to stay at Stay Inn Hostel? This double room features a seating area, tumble dryer and air conditioning. House Rules Stay Inn Hostel takes special requests – add in the next step! Stay Inn Hostel accepts these cards and reserves the right to temporarily hold an amount prior to arrival. When booking for more than 5 people, different policies and additional supplements may apply. great breakfast, the place was spotless! Only 1 toilet and 1 shower for 12 people (and only 1 common toilet in the hostel) wasn't enough. I had to wait to go to the toilet and to have a shower. I hope they increase the number of common toilets. Staff was really kind, they offered me the breakfast because I had to wait at the check in! It's really quiet and the terrace is nice. Room clean and bed so comfortable! I liked it a lot. a little bit overpriced for an 8 bed dormitory room on a on a noisy main road if windows are opened & no breakfast included, staff 50/50 friendly! The place is still under construction, so there is dust everywhere and some parts are really messy. Bathrooms are in the bedrooms, which is ok. However, the floor floods every time someone has a shower, which makes the whole place a mess after the 8 of us have showered. Also, bedrooms are in need of hooks for towels to dry and more bins (there's only a small one in the bathroom). Location is perfect and people working there (especially the receptionists) are absolutely great (some of the best I've met for the last years). Beautiful style, décor and furniture. Well-equipped kitchen. Nice rooftop garden. Really comfortable beds with curtains for privacy. Everything was perfect. I liked the curtains around the bed, so everyone had a bit of privacy. The room was cleaned every day. The terrace was nice. The staff was nice. The Wifi worked very good. I liked everything. One of the staff there was so impolite (look down us) when we asked for stuff for cooking, his attitude is really not nice. But except it everything was perfect! Everything there was perfect! Lovely outside place to chill and the room is also big enough to stay! The noise, because the room was near the street. There were too less different fruits. The beer was too expensive. Even if you get the 25% deal it is nothing than only a show. You in real pay more than outside. They are remodelling so some renovation issues like dust, drilling noises, materials in the hall are to be expected. Should be very nice when finished. Well there aren't many things not to like about this hostel but what gave me a bad impression was that at the reception they say the coffee and tea is free all day but if you only want to get coffee without paying for breakfast, for example, you cannot but I never saw the coffee machine working outside of these hours. Also, I don't think it's a good idea to have adjustable AC in every room especially the ones with a lot of people because everyone just walks in and adjusts it to the temperature they want. That was at least my experience. It would be nice to warn people that it is still partly under construction. I got wrong information while checking out about with bus to take. And the staff probably shouldn’t speak that negatively about the laziness and how he never works from other staff members in front of guests. The curtains at the bed are great it does wonders for the feeling of privacy. The common area is really well done and welcoming. There was construction going on which made it feel a little less comfortable, but staff was very nice and apologetic about it. The bunk beds are pretty small/short if you are over 190cm like my husband.